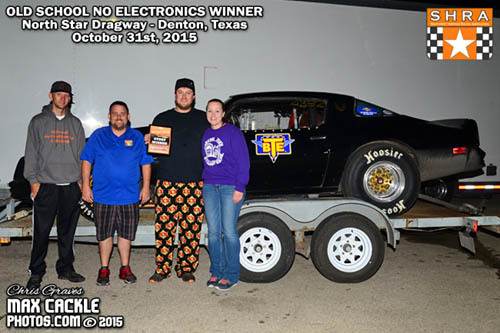 DENTON, Texas -- The MalloryPrint.com Southwest Heritage Racing Association wrapped up it's 2015 racing season at North Star Dragway in Denton, Texas in a special Halloween edition of the SHRA Championship Finals presented by Mears Mazda-Volvo. 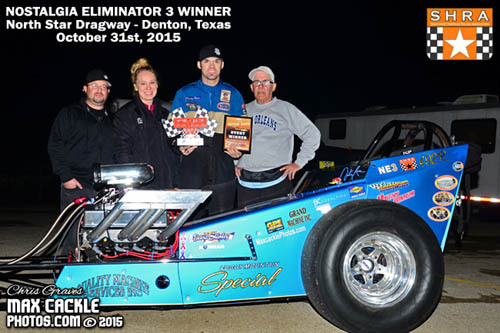 This event was quite possibly the most dramatic in the series' three year history as first time winners celebrated wins, first time series Champions were crowned and AlkyDigger Nostalgia Eliminator Shootout winners cashed in. Throw in a costume contest and you've got yourself a very festive, yet somewhat spooky evening of old school drag racing in Texas. SHRA Championship contenders were teased at the pre-race drivers meeting by the unveiling of the 2015 Champion trophies custom designed by series sponsor Meyer Enterprises, just to add a little more icing to the cake. With eighty eight total cars on the property in SHRA class racing, the series set a new attendance record and it was time to get down to business! In the very competitive Nostalgia Eliminator 1, 4.65 index class, the suspenseful battle for a Championship crown kept racers on their toes all season and in the final event every point proved critical to the three racers contending for the throne. Clay Cunningham entered the event 19 points ahead of Chris Graves after taking over the lead at the previous event in Shreveport. Jason O'Neill was in striking distance just a round and a half behind Graves. O'Neill made up ground early by qualifying number one while Cunningham claimed the third position and Graves slid in the top half in the fifth position of the ten car field. The opening round saw defending class Champion Tera W. Graves bow out in round one after an impressive AlkyDigger.com NE 1 Shootout win during the qualifying rounds of the event. 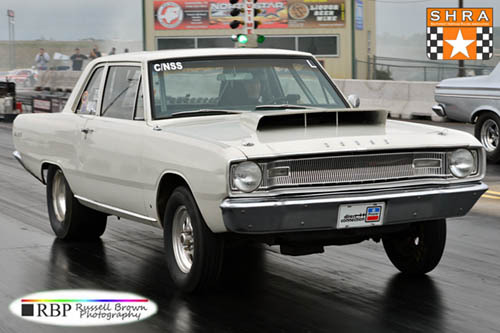 Transmission issues plagued the team throughout the year and bit again at the final event as Leonard Ament soloed to a first round win. Next out was a big match-up between points leader Cunningham and Richard Brady. Brady was off the line first and his 4.83 at 143 mph pulled off the big upset, taking out Cunningham's quicker but loosing 4.80 at 144 mph. This opened the door for Graves and O'Neill to make a move, but with chilly track temperatures and high humidity, racers were on edge and it was soon to be a driver's game. O'Neill took out Tommy Drozd to move into the second round while Graves also scored a first round win defeating Bee Godwin. Andy Mears wheeled his blown 1957 Chevy Funny Car past Steve Dunkin as the second round pairings were set. Mears continued his winning ways with a 4.76 at 142 mph to take out Ament's 5.00 at 130 mph. O'Neill scored a bye run in round two as the top qualifier and made a wicked move to the centerline shutting off early, yet moving onto the semi-finals. Graves was out next alongside giant killer Richard Brady. In a must win for Graves, Brady was off the line first but both drivers struggled for traction. A quick pedal job and dance with the centerline resulted in a win light for Graves with a 4.98 at 147 to Brady's 5.29 at 129 mph. This put Graves and O'Neill one round closer to glory and paired them up for a semi-final round that would determine their fate. Both Graves and O'Neill had struggled to find traction in the previous round and tensions were high as drivers expected the unexpected. With a win light in this round, Graves would overcome Cunningham and secure the NE 1 title. Off the line, Graves took the starting line advantage and both cars hooked up strong, the drag race was on! At half-track Graves' car made a move to the centerline and before the stripe Graves was forced to lift, but still took the win light on a hole shot with a 4.82 at 121 mph pass to O'Neill's 4.75 at 142 mph. Unfortunately for Graves, the MPH cone was dislodged in a controversial call which put Graves on the trailer and O'Neill in the finals to take on Andy Mears. Mears soloed on a bye run to a stellar 4.65 at 148 mph and with a final round win, O'Neill would now have a chance to claim the NE 1 title over Cunningham if he could defeat the red hot Mears in the final round. In the NE 1 final round, Mears looked to end the season on a high note and win his second event of the season in his third final round appearance. O'Neill and company had one round to go, the biggest round of their career. Off the line, Mears blasted to the early lead with a .002 reaction time and clicked off a 4.76 at 146 mph to win on a hole shot over O'Neill's quicker 4.72 at 142 mph. The most dramatic NE 1 competition in SHRA history came to an end with Mears in the winner's circle and Cunningham crowned class Champion by just one point over Graves, with O'Neill in third just two points behind Graves. A truly incredible finish to a highly competitive season of racing for the series' quickest class. 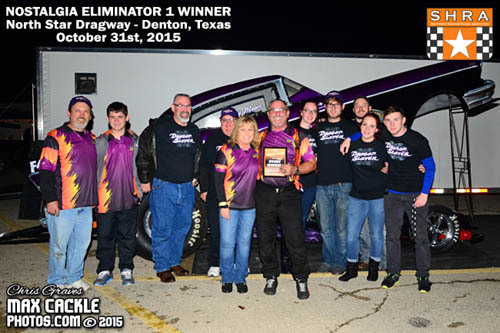 Congratulations to Mears and the "Dragon Slayer" team on their SHRA Finals victory and to Clay Cunningham and the "Still Crazy Racing II" camp from Dumas, Texas on their hard fought NE 1 Championship. The 5.00 Nostalgia Eliminator 2 category had plenty of drama in its elimination rounds as Bruce Dodson hoped to hold off the competition and score his first SHRA Championship. Thomas Hixson posted a perfect 5.00 to qualify number one with Gary Ballard in second with a 5.02 at 136 and AlkyDigger.com NE 2 Shootout winner Joel Kelton in third with a 5.05 at 134 mph. Dodson was fighting transmission issues throughout qualifying and rounded out the field in the number ten spot heading into eliminations. Ballard lined up with Rick Taylor to kick off the first round as Ballard's 5.16 at 114 held off Taylor's off pace 5.58 at 112 mph. Jason Scott posted a nice 5.08 at 133 mph to defeat Jeff Cameron and Don Holley moved into round two on a competition bye run after number one qualifier Hixson was unable to fire on the line. Ron Muncy advanced past Shootout winner Kelton when Kelton went red at the starting line and Dodson's 5.46 squeaked past Shawn McKibben's 6.04 as tricky track conditions proved a big factor in the win lights on Halloween night. Second round action brought Ballard to the line against Scott. Scott took the starting line advantage and his 5.12 at 132 mph narrowly defeated Ballard's close 5.13 at 137 mph. Muncy was out next alongside points leader Dodson. Muncy was off the line first while Dodson's car made a wicked move to the centerline and he was forced to lift. Muncy went through the traps totally sideways with a 5.46 at 119 mph pass then tagged the wall hard. Muncy was uninjured in this wild top end ride, but the car had damage beyond repair. Holley scored yet another solo pass, this bye run determined by the ladder as his 5.18 at 130 was semi-final round bound. With three cars in the semi-finals, one being Muncy who was sidelined with damage from the incident in the previous round, SHRA officials gave the go ahead for Scott and Holley to return to the lanes and run the NE 2 final round. 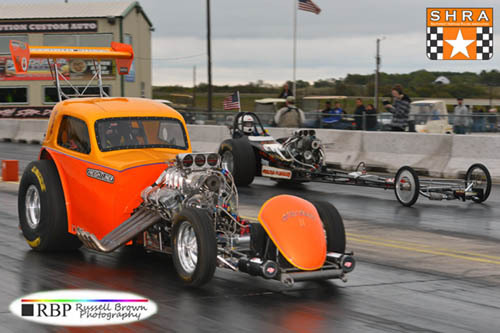 At the starting line, Holley was -.0007 red and his 5.16 bowed out to Jason Scott's 5.10 at 133 mph as Scott scored his first career SHRA event win at the SHRA Finals. Congratulations to Scott on his first series victory and to Bruce Dodson, your 2015 Nostalgia Eliminator 2 Class Champion. An incredibly tight battle from second to fifth place in the final standings found Scott finish number two in a tie-breaker scenario with Kelton. Ballard and Hixson rounded out the top five which were separated from second to fifth by just nine points. 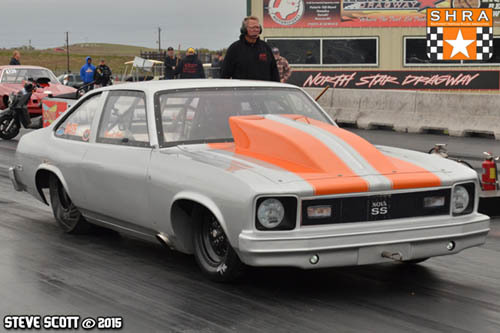 The 5.50 index Nostalgia Eliminator 3 category was purely dominated by defending series Champion Dusty Rose and that trend continued in 2015 as Rose came into the SHRA Finals atop the standings with four wins in five final round appearances. Rose showed no mercy as he qualified number one, claimed victory in the AlkyDigger NE 3 Shootout during qualifying by defeating friendly rival Gary Mitchell and by simply showing up for the final race of the season, locked in his title defense as 2015 NE 3 Class Champion! 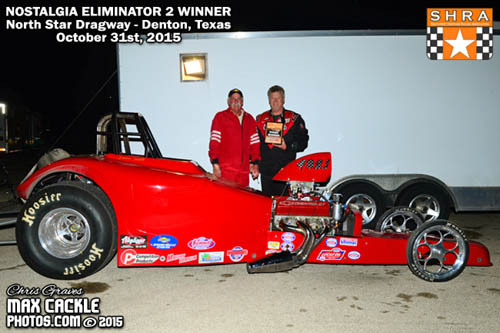 Despite the lack of a heated points battle, NE 3 racers were eager to give it their best effort to end the season on a high note with a win at North Star Dragway. Doug Morrison got the first round underway on a solo shot after Joey Myrick was unable to make the call. Morrison's 5.51 at 120 mph advanced as Josh Moseley and Joe Scarlata moved into the staging area. Mosley took the advantage off the line and his 5.57 at 120 mph held off Scarlata's quicker but loosing 5.54 at 122 mph. In a rematch of the AlkyDigger Shootout final, Rose and Mitchell came to the line as Mitchell looked for revenge. Yet again, Rose found the win light with a 5.59 at 118 mph to Mitchell's break out 5.48 at 123 mph. Semi-final action saw Morrison and Moseley pair up as Moseley lost traction immediately, while Morrison posted an early shutoff 5.70 at 106 mph. Series Champion Rose benefitted from the bye run and clicked off a perfect 5.50 at 120 mph to advance to the finals. Unfortunately for Morrison, engine problems kept him from making his final round appearance against Rose and the finals were concluded in a competition bye for Rose, who posted a tire spinning 11.26 at 51 mph to close out a truly stellar performance this season and well deserved second SHRA NE 3 Championship for the "Foggy Mountain Special" team from Moore, Oklahoma. A strong field of twenty eight cars made the call for first round of eliminations in the Old School No-Electronics bracket category. Jim Baughan entered the SHRA Finals in the lead by a few rounds over Joe Elmore, who both finished in the top five in 2014. In a surprising first round upset, Baughan bowed out in a break out run against Curtis Horne. In the first pair of round two, Stephen Foster took out Elmore which in turn locked up the class Championship for Baughan. Congratulations to the entire team on their first SHRA Championship! As eliminations continued, semi-final round action brought SHRA first timer Aaron Jones to the line to take on Foster, who was quickly climbing the points charts with win lights. Jones dialed a 7.75 and was dead on with a .077 reaction time to take the win over Foster's 6.11 on a 6.08 dial. The final pair of the semi-finals saw another SHRA first timer, Jake Howard, set to face off with Mickey Frey. Howard dialed a 6.51 and his 6.46 took the win in a double break out pass where Frey went 7.08 on a 7.19 dial. With their semi-final round finish, Foster and Frey moved into a respectable second and third place finish in the standings separated by just one point. A first time SHRA winner was guaranteed in Old School No Electronics as Jones and Howard did their burnouts and crept to the starting line. This one was settled on the line as Jones went -.033 red and wasted a dead dial 7.74 pass, while Howard posted a .003 reaction time and went 6.49 on his 6.51 dial in. Congratulations to Jake "The Snake" Howard on his first career SHRA event win at the SHRA Finals and again to Jim Baughan, your 2015 Old School No Electronics Class Champion! 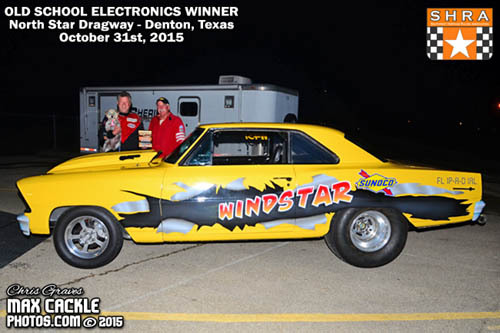 Old School Electronics welcomed twenty four cars to the first round of eliminations in Denton, Texas. Defending series Champion Russell Cook entered the event just thirty four points ahead of second place Alex Garca, who was surprisingly not in attendance, opening the door for cars below him to move up in the standings. Josh Freeman entered the event in third place but had a big gap to make up in his effort to catch Cook for the title. In round one action, Cook took the win over Old School No Electronics runner up Aaron Jones, which sealed the deal for Cook and company as they mathematically clinched their second straight SHRA Old School Electronics Championship! Round two saw Freeman bow out with a red light, but Freeman was able to still hold on to his third place points finish in 2015. Rounds dwindled down to the semi-finals where Cook was still in action and met 2014 SHRA Finals winner Warren Wright. In a great race, Cook was .007 and Wright was .008 on the tree and at the stripe Wright upset the Champ with a 5.68 on a 5.70 dial to Cook's 5.69 on a 5.74 dial, a double break out affair. Mark Ellis moved into the final round on a bye run with a 5.60 on a 5.57 dial to meet Wright in the last dance. Ellis was on his game at the starting line as his .002 reaction time took the advantage early, but his 5.62 on a 5.58 dial was no match for Wright's dead on 5.69 coupled with a .011 reaction time. 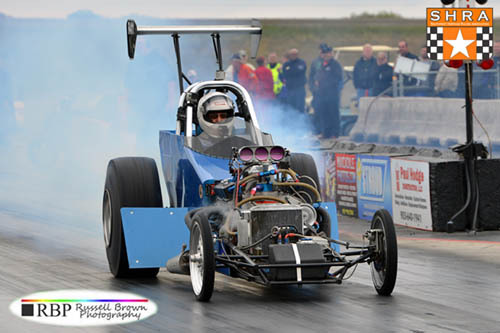 Wright scored back to back SHRA Finals wins and climbed the points ladder with his win, securing the fourth position in the final standings in Old School Electronics. Congratulations to Warren Wright on his event win and again to Russell Cook, your two time class Champion! The inaugural season of the SHRA's newest class, Nostalgia Super Stock, welcomed a great new group of racers to the series and some awesome stick shifting action all season. Vic Corlett muscled his way to the top of the standings with strong performances all season, entering the event with two wins and four final round appearances, giving him a comfortable lead in the standings with one race remaining. The opening round of eliminations found Mark Buchanan taking out David Ardoin. Tony Smith took the win light over Ronnie Smith and Missouri racer Rosie Kossuth knocked out James Durham. Corlett moved into the semis with a bye run as the number one qualifier as four cars were semi-final round bound. Corlett and Kossuth lined up in the first pair of the semis and Corlett's 7.11 on a 7.05 dial was enough to score his fifth final round appearance over Kossuth's 6.66 on a 6.41 dial. Tony Smith posted a nice 7.08 on his 7.05 dial to defeat Mark Buchanan's 7.14 on the same 7.05 dial. Smith and Corlett were ready for their final race of the year and this one was over early when Corlett went -.034 red, as Tony Smith scored his first SHRA event win with a 7.11 on a 7.05 dial. With his win, Smith moved into the number two points position to end the season. 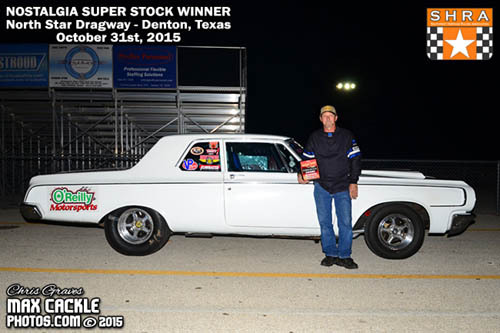 Congratulations to Smith on his SHRA Finals victory and to your 2015 Nostalgia Super Stock Champion, Vic Corlett! The 2015 Southwest Heritage Racing Association season set attendance records across the board, with 244 different racers participating in the six classes this year. The SHRA would like to thank all the racers and fans who supported the series in its third season. 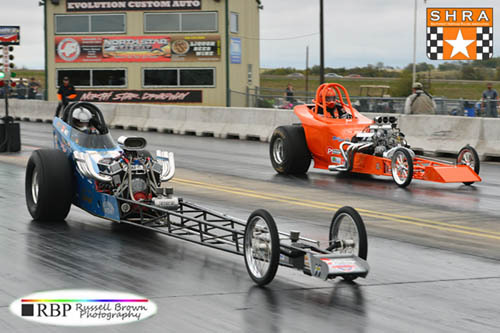 The SHRA would like to recognize and thank all the sponsors who supported our 2015 racing season including series sponsor MalloryPrint.com, Alky Digger, Good Vibrations Motorsports, Mears Mazda-Volvo, Meyer Enterprises, Equipment Sales and Service of Texas, Bubba's Tow, Neil & Parks Racing Enterprises, Bad Behavior Racing, Lenamond Auto Supply, Gary's Muffler Shop, Competition Sales of Dallas, Harry's Hot Rod, Hayden Enterprises, Howards Cams, Competition Products and Safety Boost. For more information on the Southwest Heritage Racing Association, visit us online at www.shraracing.com. 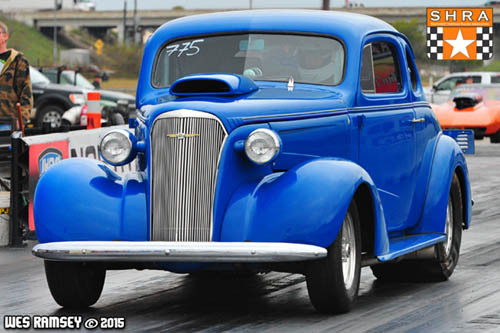 The 2016 season schedule is already in development and will surely provide another year of competitive, fun, old school drag racing action across the Southwest! Until then, we wish all the SHRA racers, staff and fans a festive holiday season and we'll see you at the drags next year!